Kesari Devi Charitable Trust (KDCT) was established in 2010 in Varanasi, Uttar Pradesh. The key driver for the formation of KDCT was the mediocre quality of education provided to children, especially in the rural and backward areas. The trust aims to reduce learning disparities and provide education to community at an affordable cost. Six of the eleven trustees are educationists and offer the relevant expertise for this trust. KDCT had started a temporary school for 40 students from standard I to standard V charging nominal fees. Of the 40, only 10% managed to pay the fees, the remaining were educated free of cost. KDCT intends to set up a regular school with the best possible facilities and plans to achieve its objectives in two phases. In the first phase, the trust plans to build a junior school (nursery to standard VIII) and in the second phase, it plans to expand the school to the secondary level (upto standard XII). As a first step towards its objective, KDCT has purchased a small piece of land for construction of the junior school. The temporary school has been closed down and the students have been integrated into other schools. The trust plans to direct most of the resources it receives in the coming years towards construction of the junior school. Total income: Since its inception, KDCT has resorted to a fund collection drive to launch and sustain the trust. The main source of income has been donations from family, colleagues, friends and former students. KDCT has made a small start in raising some corporate funding in FY13. This accounted for around 5% of total income and is included in donations. 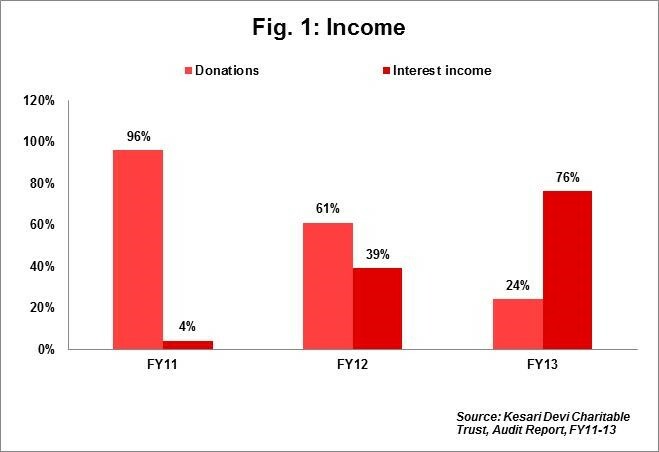 Donations accounted for 24% of total income in FY13. KDCT has not managed to secure funds from alternate sources. Though KDCT charged nominal fees from students, only 10% managed to pay. All this can partly be the reason for decline in donations from Rs80,000 in FY11 to Rs35,000 in FY13. Interest income accounted for 76% (Rs0.1mn) of total income in FY13. The increase in interest income from Rs3,500 in FY11 to Rs0.1mn in FY13 can be largely attributed to high bank balances maintained during FY11-FY13. (Ref Fig 1). Programme expenses: In FY13, expenses totalled Rs0.15mn with 78% (Rs0.12mn) of total expenses incurred on core programme activities (sector average: 83%). 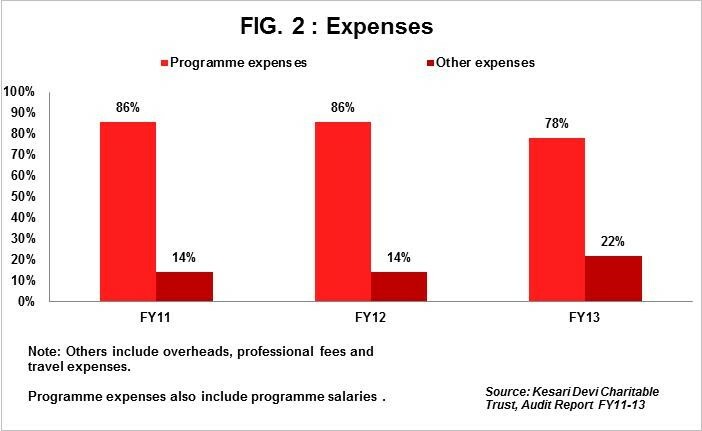 Programme expenses for KDCT comprises of expenses such as salaries, school fees, stationery, etc. incurred for running the temporary school. The temporary school has been closed down in FY13-14 and the children are accommodated in other schools. KDCT paid school fees on behalf of children who could not afford it. Overheads: Overheads accounted for 13% (Rs19,000) of total expenses which were in line with the sector average of 12% in FY13. Expenses incurred on printing, bank charges and such other administration expenses were included in overheads. (Ref Fig 2). Trust corpus and bank balance: KDCT has been setting aside funds towards trust corpus to facilitate construction of the junior and secondary school. Trust corpus accounted for 99% (Rs3mn) of total funds in FY13 and recorded a CAGR of 264% during FY11-FY13. The corpus fund along with the Y-o-Y surplus is deposited in the bank to cumulate and earn interest income. Income Growth rate: KDCT posted an income of Rs0.1mn in FY13. The income CAGR was 31% during FY11-FY13. KDCT witnessed a marginal growth rate of 2% in FY13 against growth of 67% in FY11. Self-sufficiency ratio: The ratio measures ability of an organisation to meet expenses out of its own funds. Own funds include donations and interest income. The self-sufficiency in FY13 was 96% as own funds were the only source of income for KDCT. While the ratio appears high, note that expenses are being kept at low levels, in line with the income and KDCT needs substantial funds to meet its planned goals. Donors support: So far, KDCT has managed to source funds from close acquaintances. It managed to raise Rs2.4mn from 53 donors in FY12, and additional Rs1.3mn from 40 donors in FY13. This implies the credibility KDCT has earned amongst the donor class. KDCT has garnered the support of colleagues, friends and former students. However, it has to raise funds to the tune of Rs20mn for its junior school and Rs25mn for its senior school which seem beyond the scope of general donations Hence, KDCT seeks funding from institutions and corporates. Lack of funds: KDCT has so far managed to raise funds from close acquaintances for the school. However, donations only from close acquaintances are not sufficient to reach the target of Rs45mn. Hence, KDCT is seeking institutional support especially from corporates for completing its projects. On completion, KDCT anticipates that 50% of the total students will pay the full fee, 25% would pay half and balance would not be able to pay anything. Hence, KDCT is also looking for sponsors to meet the running expenses of the school. Trained staff: KDCT foresees a challenge to recruit trained staff once the project is complete and the schools are functional. The teachers have to be trained to deliver quality education that meets the vision of the organisation. There are eleven trustees on Board of KDCT. Of these, six trustees are senior professors of Banaras Hindu University, two have a legal background and the remaining three are successful professionals or entrepreneurs. The Board meets twice a year or sometimes even thrice a year. As the organisation is relatively new, it has not yet been listed with any accrediting agency.